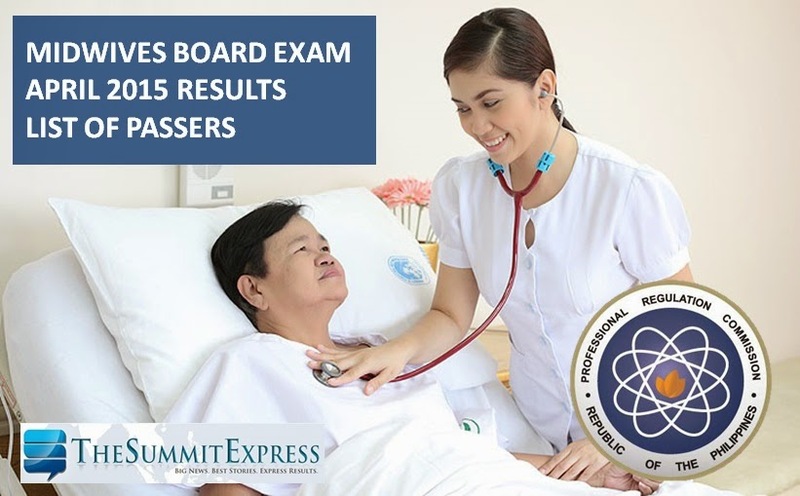 Those awaiting results of April 2015 Midwifery board exam may find here the list of passers, top 10 (topnotchers), top performing school and performance of schools as the Professional Regulation Commission (PRC) and the Board of Midwifery (BoM) released results in 3 working days after the exam. PRC on Thursday said that 882 out of 1,968 passed the Midwife Licensure Examination. The result of examination with respect to one (1) examinee was withheld pending final determination of his liabilities under the rules and regulations governing licensure examination. Midwives board exam was conducted in the cities of Manila, Baguio, Cagayan de Oro, Cebu, Davao, Legaspi, Lucena, Tuguegarao and Zamboanga on April 19-20, 2015. The midwifery board exam covers the following major subjects: obstetrics, fundamental of health care and infant care and feeding April 19 and primary health care, professional growth and development on the 20th. In the same period last year, PRC announced results in 3 working days after the last day of exam. A total of 1,093 out of 2,365 hurdled the exam. Jose Fabella Memorial Hospital School of Midwifery was named top performing school with 94.44 percent passing rate. In November 2014 exams, results were out online in 4 working days. 1,401 out of 2,768 passed the Midwife Licensure Examination according to PRC. However, none of the schools qualified for the top performing school list.